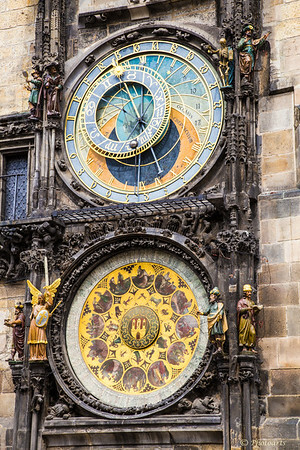 Completed in 1410 AD, Prague astronomical clock in Czech Republic is the longest working clock of its kind in the world. Four figures at the top which move at the top of each hour represent the things most hated at that time. Vanity is represented by man holding mirror looking at himself at top left, then greed by man holding bag of gold, death by the skeleton top right followed by figure playing an instrument representing lust! This is a fantastic capture. That is a lovely and elaborate clock. I love all the figures on it. Well done! What an amazing clock--so glad it has survived all these centuries, and is even still working! Fantastic survivor, and great shot of it.